The time has come to end forever the silly “debate” on the claimed existence of a “gas chamber” at Auschwitz I. 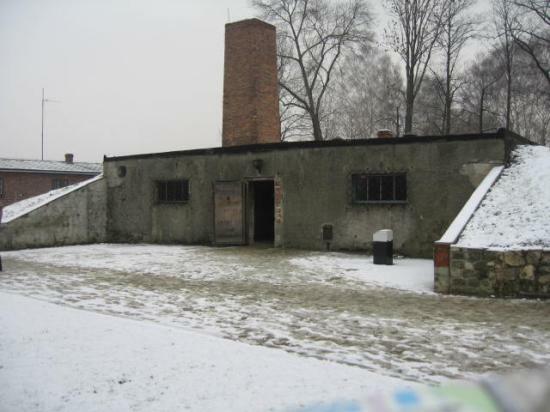 The alleged "gas chamber" at Auschwitz I, complete with fake "chimney," as shown to tourists. 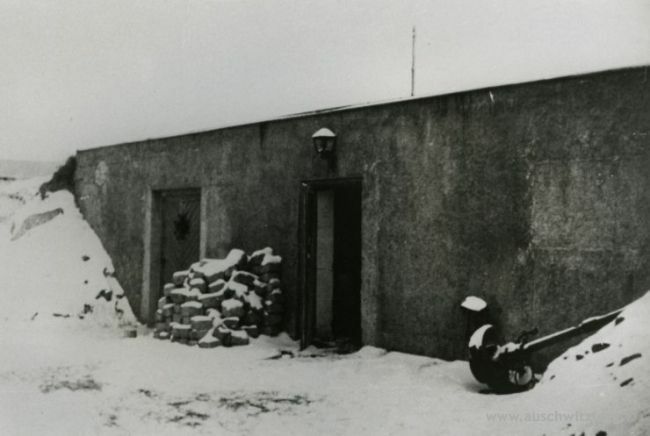 The alleged "gas chamber" at Auschwitz I, photographed in 1945 after the German defeat, showing no "chimney." Let’s be absolutely clear about this: this “gas chamber” — still the “main” tourist attraction in the entire Auschwitz legend, through which literally millions of unsuspecting tourists have tramped — is a post-war fabrication from start to finish. Anyone who had any doubts about can do themselves a favor and consult even the Holocaust Storytellers’ own accounts. 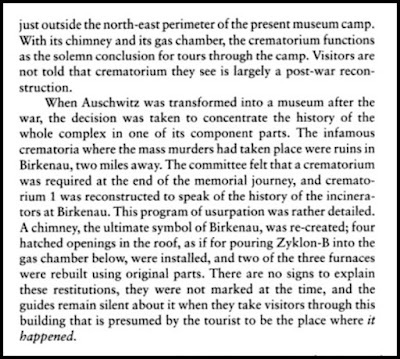 “With its chimney and its gas chamber, the crematorium functions as the solemn conclusion for tours through the camp. Visitors are not told that crematorium they see is largely a post-war reconstruction. “When Auschwitz was transformed into a museum after the war, the decision was taken to concentrate the history of the whole complex in one of its component parts. The infamous crematoria where the mass murders had taken place were ruins in Birkenau, two miles away. 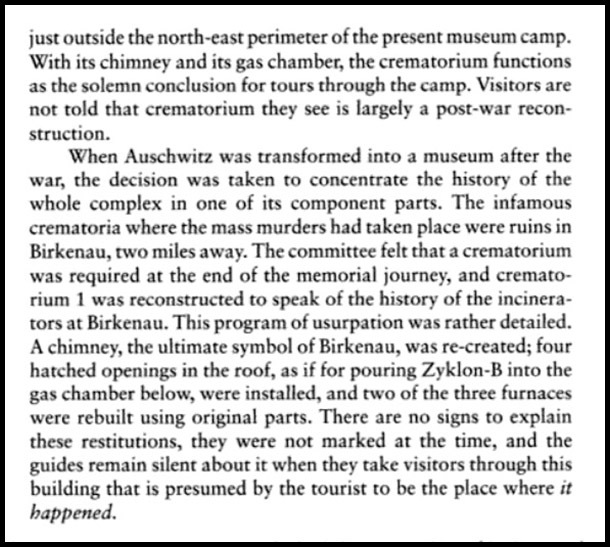 The committee felt that a crematorium was required at the end of the memorial journey, and crematorium I was reconstructed to speak of the history of the incinerators at Birkenau. This program of usurpation was rather detailed. A chimney, the ultimate symbol of Birkenau, was re-created; four hatched openings in the roof, as if for pouring Zyklon-B into the gas chamber below, were installed, and two of the three furnaces were rebuilt using original parts. 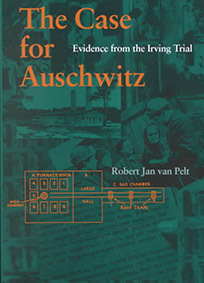 There are no signs to explain these restitutions, they were not marked at the time, and the guides remain silent about it when they take visitors through this building that is presumed by the tourist to be the place where it happened.” - Robert van Pelt, The Case for Auschwitz: Evidence from the Irving Trial, (Indiana University Press, 2002, ISBN 978-0253340160), page 121. So there you have it, from the horse’s mouth as it were. Everything in the “gas chamber” at Auschwitz I: the ovens, the unattached chimney, and the “Zyklon-B insertion holes” in the ceiling are post-war additions. Everything. Let’s not even argue about this any further. 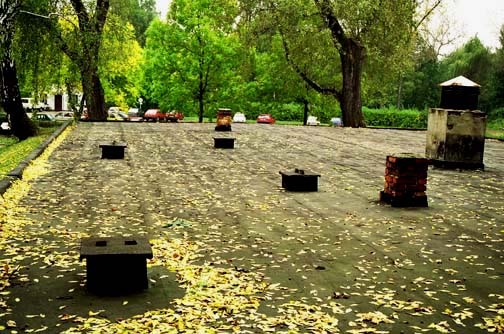 The fake "Zyklon B insertion holes" on the roof of the alleged "gas chamber" at Auschwitz I: Built in 1947, the camp museum and official Holocaust storytellers now admit. The "recreated" ovens in the alleged "gas chamber" building at Auschwitz I: another post-war (1947) addition, now admitted to by the camp museum and all official Holocaust storytellers. As a matter of interest, the Auschwitz Museum has been steadily forced to retract its position on this “gas chamber” over the years. 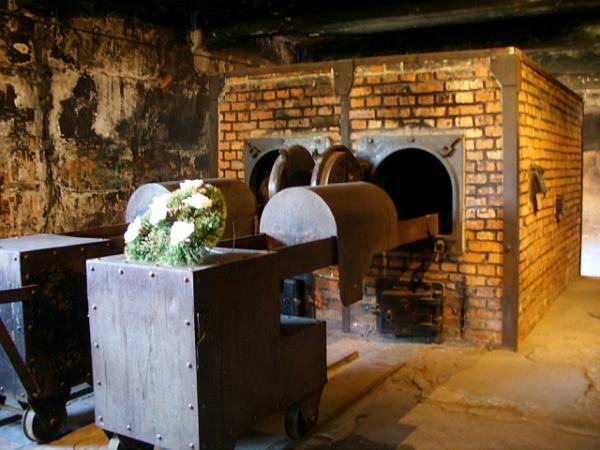 The official Auschwitz Camp Museum,website in 2006 admitted that the "chimney" and "two incinerators" had been added to the building after the war. 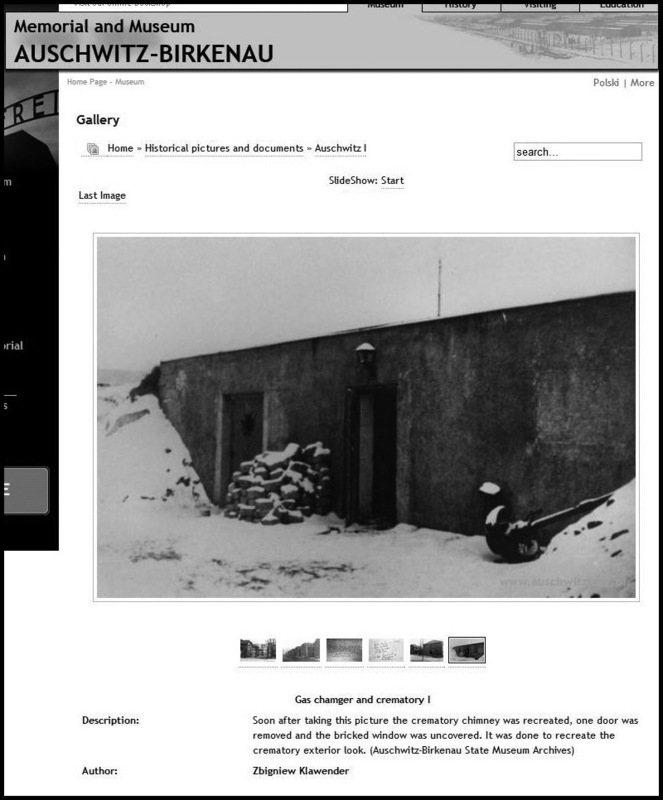 This continued, the 2006 Auschwitz Museum website continued, until July 1943, when the “incinerators, chimney, and some walls were dismantled and the holes in the roof, through which the SS men had poured Zyklon B, were sealed. 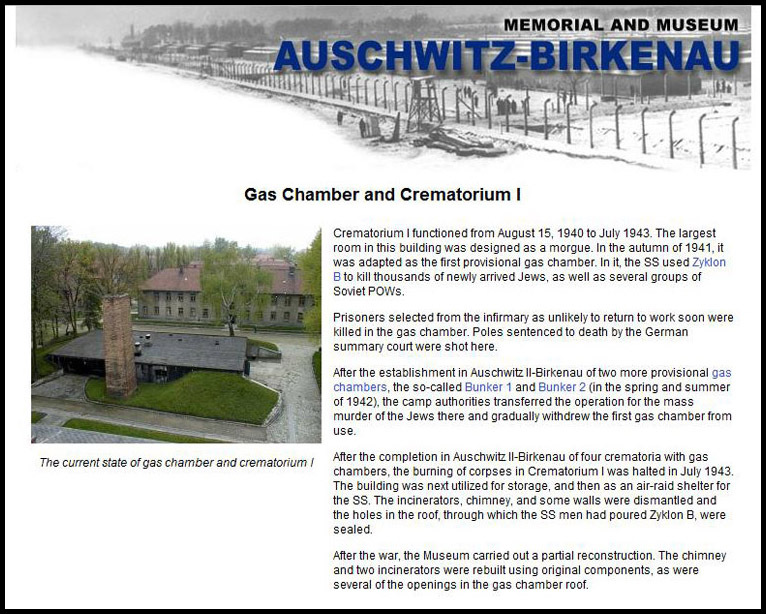 So in fact, the official Auschwitz Museum admitted as early as 2006 that the “gas chamber” had been rebuilt, although they still continued to claim that it had actually been a gas chamber. Gas Chamger[sic] and Crematory I. 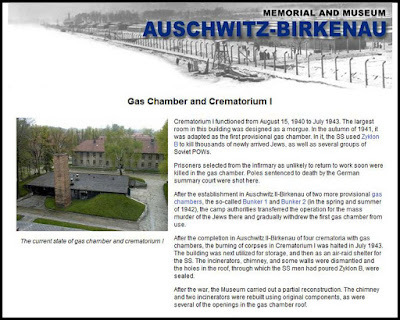 In 2012, the Auschwitz Camp Museum website admitted even more post-war "reconstructions" to the alleged "gas chamber" at Auschwitz I. 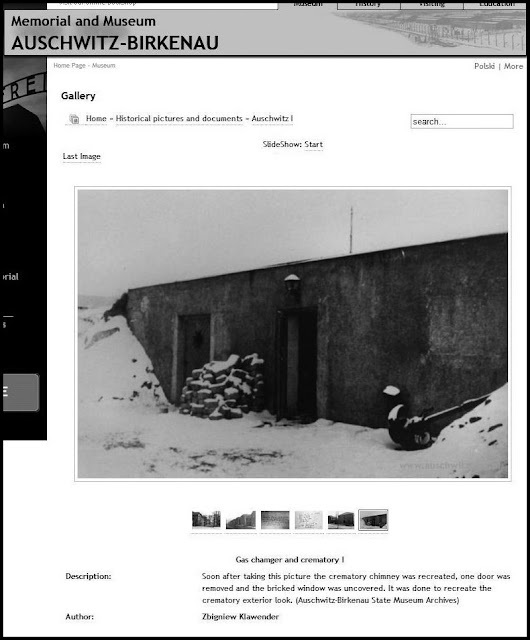 Once again, the official Auschwitz Museum website admitted that the building had been “recreated” and although they still called it a “gas chamber” they were far less forthcoming about the details and date of operation as they had been in 2006.
. . . the Holocaust Storytellers still insist that it was used as a “gas chamber” . . . One has to wonder just how stupid they think people are to believe their nonsense. Thank you for the update, Mr. Winter. Now into its 7th Edition! 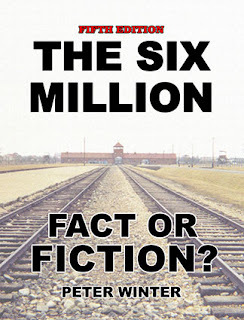 Revised, edited, updated, and expanded, this work is without doubt the single most important revisionist overview of the legend of the “Six Million” Holocaust ever yet published. All material copyright Peter Winter. Unauthorized reproduction prohibited. . Picture Window theme. Powered by Blogger.